95 registered members (2015_PSD, alphadog, AdditiveOCD, 53' Stude, 2009Edge, AndyB, 9 invisible), 1,945 guests, and 25 spiders. I recently found one of these tucked away indoors. Original owner, needs a good cleaning but looks to be in very good shape. Passed the solid floor and transom test. I looked in the ski locker and the floor is solid in there as well. I don't think it was used very much, and always kept indoors and dry. It has the original snap-on mooring cover that's in great shape. I think there's a bimini for it too. It has a Mercruiser 140 and Alpha One drive. I don't think the boat has been ran in the last 5 years. The trailer looks OK from what I can tell. The tires are dryrotted and are original from what I can tell by talking to the owner. Anyone familiar with these? 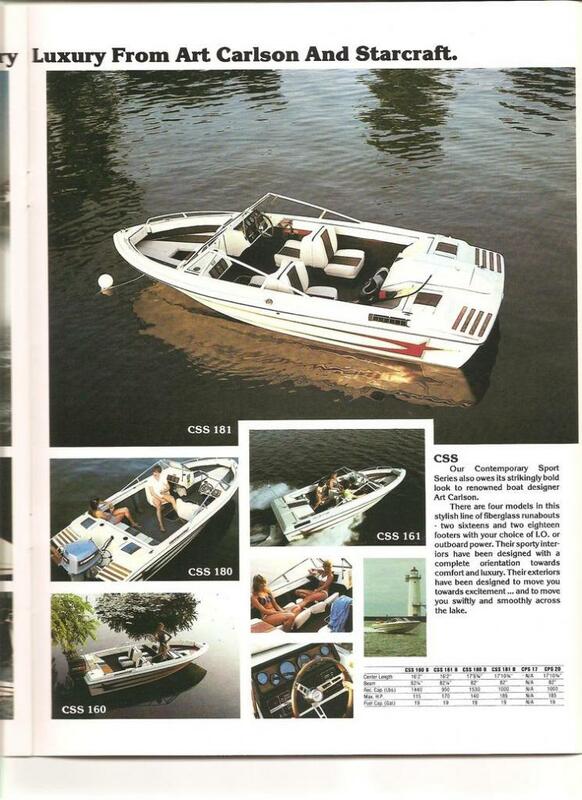 I'm having a hard time finding owners manuals or really anything about these boats. On the inside there's a plaque that says "Designed by Art Carlson CSS Contemporary Sport Series." I'll get some pictures when the weather warms up. Last edited by BigCahuna; 04/15/18 03:11 PM. Do the manifolds need replaced on these 4 cyl inboards like they do on the V8's every 5 years? First without spending a ton of money you need to get an idea if the block is cracked. See what is in the block, antifreeze would be good. Look at the freeze plugs. Get the carb rebuilt (Tredwell Carb in in NY). Change the oil & rotor, dist cap, plugs and start it up and check again for block damage from freezing. Get the 3 bellows replaced along with lower shift cable. Change the water pump impeller in the outdrive. Maybe replace the trim sensor and trim limit switch while the outdrive is off to replace the bellows. Pull the prop and have it repaired if it's damaged. Grease prop shaft. Grease zerks. Hold off on the trailer tires as long as they hold air until the engine and out drive are checked out. Drain the gas, add a gallon of alcohol let it sit for a few days, flush with a gallon of gas. Buy a few gas filters and keep a spare in boat. There maybe a 2nd gas filter at the carb. I think that engine has an odd ball alternator. You are close to $1000 for outdrive maintenance. I would get someone to do the bellows. If they fail, boat sinks. If things look good, move on to trailer. Maybe LED lights. Check bearings. Replace the tires. Last edited by Donald; 04/15/18 03:46 PM. I know it was winterized before stoage, the bellows were also done (5 years ago though). Not sure what the deal is with the gas but it's likely bad even if it was treated before storage. I was going to just run it (assuming it starts) and then change the fluids after. I'll try to get some pics because it is in much better shape than most would like to believe, especially for an 86. The main thing is the fact that it's been sitting for so long. Anything to do with boats is expensive. Was the boat stored with outdrive up or down. Bellows get replaced by age, between 5 and 7 years. The outdrive should be pulled and u-joints greased. Water pump impeller should be replaced. Outdrive gear oil changed. Even if things look good, assume prev maint was not done correctly. If you are new to boating, remember there are USCG required items to be on board. Suggest a fixed or handheld VHF radio. Cell phone does not replace a VHF radio. Expensive is a relative term. I know people who have 16' aluminum boats who spend $ 50 in maintenance and buy 5 gallons of gas a year to fish all season long. There are also 26' cabin cruisers that cost $ 300 a day in fuel alone to go from one end of the lake to another. It all depends on the boat. There's no way it is going to cost $ 1,000 to do bellows and change drive oil, even if you pay someone to do that. A bellow kit is $ 120 and a few quarts of quicksilver are $ 20. A boat is a hole in the water in which you throw money. Yeah and cars are carts in the driveway, usually bank-owned, in which you throw money. boats are fun. period. I've owned multiple. I currently have two: 1988 Bayliner that I bought new; and the 2005 Starcraft. The Bayliner has been great - I do all that maintenance myself - although it is an outboard. Starcraft is a fun company - I met a few of their people when I worked in the industry. Donald has given some pretty good advice; I had some bellows leak a little (11 year old boat, not the Starcraft); had a fuel pump fail (stupid internally-painted Volvo two stage pump). other than that my maintenance costs have not been bad. Keep in mind this will be a project more than anything else. I also live 5 miles from a state launch. I'll probably get one of those trolling motors that mount to the outdrive to use for fishing, and as a backup in case the 3.0 decides not to run.